Tornadoes are highly destructive weather events that now seem to arrive in clusters, up to 30 at a time. Host Steve Curwood hears from climate professor James Elsner, of Florida State University, how his study suggests that with climate change there are fewer days with tornadoes, but when they do come they are in clusters and more powerful than before. CURWOOD: From the Jennifer and Ted Stanley Studios in Boston and PRI, this is Living on Earth. I’m Steve Curwood. A warmer world is leading to more volatile weather events including extremes of heat and cold, and rainfall. 2014 was the hottest year on record, and with the rising concentration of greenhouse gases that trend of extremes will likely get worse, but it’s a challenge to predict how that might affect tornadoes. It’s not that there are more of them, but there do seem to be more ferocious bursts of tornado activity – with the biggest more than a mile wide and as many as 70 touching down over a couple of days recently. Professor James Elsner of Florida State University has been looking into the possible links between climate change and tornado behavior, and published some results of his work in the journal Climate Dynamics. ELSNER: The number of tornadoes from year to year doesn’t change very much. We get about 1,000 tornadoes a year, some years more than others. But there's no long-term trend, so we looked at instead is how many days are there with tornadoes? And we found that there's actually fewer days in which tornadoes form and so that means that a day with tornadoes has to have more tornadoes if the total number isn't changing. CURWOOD: Why do you think that is? Why are tornadoes bunching up? ELSNER: Well, it's not clear yet. What we speculate is happening is as the climate warms were seeing more moisture in the air, more humidity. And that's really the fuel for tornadoes. But at the same time the higher latitudes are warming faster than the lower latitudes, and so that tends to decrease the amount of winds that are blowing aloft above the ground. And so you need both of these ingredients; you need strong winds blowing above the ground and you need humidity to create the conditions for tornadoes. And so it seemed like it a kind of a draw. So it appears that even though we're seeing less or slower winds, when they do blow fast on occasion then the extra humidity creates days with lots of tornadoes. CURWOOD: So tornadoes are now occurring more in clusters. How close together are they and how long between touchdowns? ELSNER: On a given day we can get a family of tornadoes. We can get a single thunderstorm producing a tornado. We call that a super cell thunderstorm and that tornado then can then last anywhere from just a few minutes to 20 or 30 minutes on average, only about five to six, maybe up to 10 minutes. But then it can recycle and as the storm continues to move downstream, maybe an hour later, two hours later it can produce another tornado. So we're seeing this type of thing happened more regularly. CURWOOD: Typically how many tornadoes come in these clusters? ELSNER: Well that can range. We can see a single isolated tornado, but what were seeing is generally between 10 and 30 tornadoes in a given cluster. CURWOOD: Wait, you said 30 tornadoes on the same day near the same place, really, or in the same storm system? ELSNER: Yes, well I mean, not at the same location exactly, but over an area the size of eastern Kansas, for example. I mean, I think the fact that they are bunching up both in space and time is cause for some concern. CURWOOD: Now, as I understand it, the United States has more tornadoes than any other country in the world. Why is that? ELSNER: Well, the United States is in a unique position, at least in the central US, in that there is a mountain range to the west that runs mostly north to south, the Rocky Mountains. And then, in close proximity to that, the Gulf of Mexico, and the gulf provides the source for the heat and moisture, and when that starts flowing north in the spring time, that encounters the fast-moving winds above the ground flowing over the Rocky Mountains. And so those are the conditions that tend to produce the tornado outbreaks. CURWOOD: What about the strength of these tornadoes? 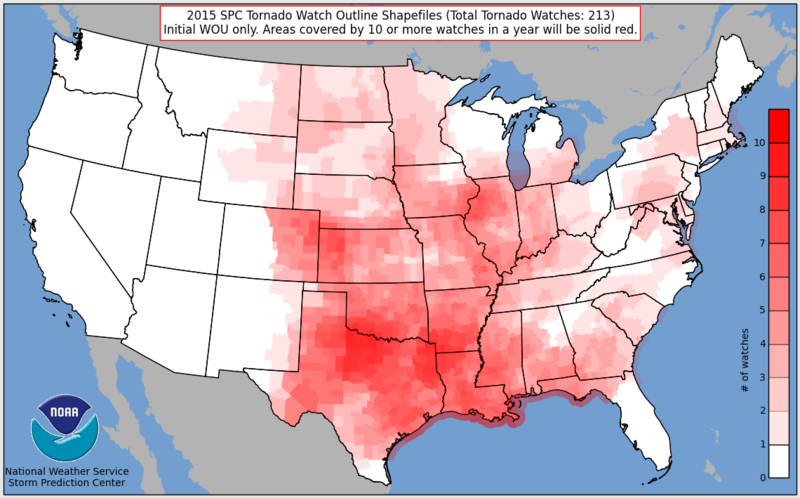 How do today's tornadoes compare to the ones a decade or two ago do you think? it’s not clear whether that trend is due just to better ways of surveying the damage or whether that's part and parcel of this warm or warm waste atmosphere that allows the tornado to stay on the ground longer and become more ferocious. CURWOOD: What does your work tell you or suggest about the future of tornado events as, well, the climate continues to warm? ELSNER: Well, most of my research is based on looking at the historical record and so it's difficult to just extrapolate these trends that we are starting to detect into the future without a strong theoretical background of why this is occurring. So that has to be worked out yet. But there are some ominous indicators especially with the clustering and perhaps the length and width of these tornadoes, and so I think we have to pay attention, we have to do more research, try to understand why this is occurring. CURWOOD: Number one suspect...climate disruption? ELSNER: Yeah, I mean I think climate change is having an effect on the tornado activity. I don't think folks would have imagined this even 10 years ago but I think there is a connection and you know it may not manifest itself in the next couple of years, but I think there is some indication that we could see more powerful tornadoes, longer-lasting tornadoes and just more of a cluster of these tornadoes going into the future. CURWOOD: James Elsner is a Professor at Florida State University and co-author of the paper "The Increasing Efficiency of Tornado Days in the United States." Professor, thanks so much for taking the time with us today.